A quick linguistic note I just feel I need to write. If you make a search on the etymology of Varduli (one of the historical Basque tribes of the early Roman era), we find that it is almost invariably attributed to the alleged Celtic root *bhar- meaning border, frontier. This is the same logic used with the better known tribe of the Vascones, which gave their name to Basques in general later on in Indoeuropean languages. One of the problems here is that Latin letter v was not originally /v/, much less /b/ but originally just /u/, i.e. the same sound as English w when used as semi-consonant. In fact the letter u did not exist in Classic Latin, just v (i.e. IVLIVS: Julius). Both letters j and u evolved only at a later stage. However both cases are documented with other phonetics: Varduli in Greek are said Bardoúloi, Bardiétes (where the B, beta, should sound like English v). In the case of the Vascones there is a coinage with the word Barscunes, which should sound /b/ and is the main link to the alleged Celtic root *bhar-. Often the country of the Varduli is assimilated to Gipuzkoa but the actual Varduli did not just occupy most (not all) of that modern province but their domain extended much further south into lands now belonging to the provinces of Navarre and Araba until the Ebro river. Their capital was in fact the town that Romans named Ara Coeli, later Araceli and that Basques know by the compound name of Uharte-Arakil (Sakana valley, Navarre), where Arakil is obviously Ara Coeli but Uharte is a Basque word that means island or more precisely between waters (ur-arte). Therefore Uharte is the genuine Basque name. My understanding is therefore that Varduli means nothing else than Uharte-Uli (shortened to Uhartuli), i.e. the city of Uharte. Uli, ili, uri, iri: city in Basque and Iberian, as well as many other Mediterranean languages (cf. Ilion, *Irisalem, *Iriko, etc. ), being a clear wanderwört of prehistoric origins. Today it’s said mostly “hiri” but toponimy includes all variants: Uribe, Basauri, Ulia, Irun, Iruinea, Pompaelo (= Pompaeius-Ilu), etc. Therefore the rewriting of this ethnonym with Greek beta (/v/) seems a misunderstanding by those cartographers who used it. Harder is to be certain about other ethnonyms but if I’m correct about the true meaning of Varduli, it may mean that other tribal names reported by Greco-Roman erudites could also mean locations, such as towns, without further ado, mistaken by collective denominations. I know that it was usual to add the suffix -ani or similar to these cases (example: Basti → Bastetani) but probably the ancient cartographers did not have enough knowledge in all cases, especially if their sources were second or third hand. A notorious case is in my opinion the name of the Astures, which could well mean, if Basque (or otherwise Vasconic), Aitz-Uri, i.e. the city (uri) of the rock or mountain (aitz). We know that the capital of the Astures (Asturica Augusta for the Romans, Astorga by the modern name) existed since at least the Atlantic Bronze Age, so it is not like nearby Legio Augusta (León) a Roman foundation by any means. So it seems, on first sight, plausible that the ancient Astures were also named by their capital city: Aitzuri, now Astorga. However on second thought, it happens that Astorga is located on flatlands, but, as you can see in this picture, right under an often snowed mountain. Aitzuri can also mean (and would be the natural translation in modern Basque) white peak. I leave this open therefore because it could mean either. Another ethnonym of ancient North Iberia that seems very Vasconic is Artabri (sing. Artabrus), who lived in what is now Northern Galicia, next to the Astures. A plausible Basque etymology can well be Arte-Buru, i.e. the head of the holm oak (Q. ilex). The holm oak grows well by the coast, precisely where the ancient Artabri lived, being like other oaks often considered special and a sacred meeting place. The second compound buru (head) may mean either a promontory or hill, if geographic, or maybe chieftain, leader. This would lead us to the similarly-sounding name Cantabrus/-i. If -brus is indeed buru (head), what is canta-? Possibly gain, gane (height, peak) maybe in the form ganeta (zone of peaks, the peaks), very common in Basque toponymy. If so, it could well be ganeta-buru: the head of the peak-zone, what makes good sense, especially if we reckon that the Cantabri were a confederation of many smaller tribes (→ approximate map, notice that the eastern border has been displaced surely for modern political reasons). I don’t wish to finish without mentioning the Ausci. Sometimes this Aquitanian tribe, the larger one among northern Basques, is said to be at the origin of the Basque endonym euskaldun, which derivates from euskera (Basque language), having the pseudo-mysterious root eusk-. The apparent similitude between Ausci (/awski/) and eusk- (/ewsk-/) has led some to propose an etymological relationship. However I tend to think that euskera derives, like all other words beginning with eusk- from the verb eutsi (hold, persist, resist), where -ts- transforms regularly into -sk-. Hence euskarri (pillar, lit. holding stone), euskailu (bowl, lit. holding gadget), etc. Euskera would therefore be the persistent (eutsi) mode, lifestyle or language (-era), in contrast with erdera (applied to all non-Basque languages but primarily Indoeuropean ones) which should mean the dividing (erditu) mode, lifestyle or language. It is difficult to find a meaning for the ethnonym Ausci but it does not seem to make sense from the verb eutsi, as there is no suffix attached. The singular form was Auscus, what makes me think of the Navarrese village of Aezkoa (where -a is nominative article and -ko must mean of a place). Aez- here could well be aitz (rock, peak) again (of the rock therefore, no wonder considering its location) or alternatively could well be a shortening of ametz (a type of oak, Q. pyrenaica). But while these etymologies seem to fit well for Aezkoa, they are more difficult to relate to the Ausci, who lived in the northeastern flatlands near the Garona (Garonne). A bit far fetched but a possible etymology could be ahozko, meaning oral: aho = mouth, -zko= made of. Ahozko is a real word, not something I just made up. However “the orals” is not something that sounds correct so maybe for them it could mean something else, like those who speak or whatever. If so I wonder if my previous best guess about the origin of the word euskera was wrong after all, could it be just ahozkera, i.e. the oral (or spoken) mode or language. Could it be that the divide meaning of erdera refers to being partly written, as happened with Latin? Enough for this quickie linguistic note. Thanks for reading and feel free to add comments, especially if you’re open-minded. the site and started to destroy these historically important remnants. against international agreements signed by Turkey,” they said. A new study of the Iberian script findings withing the (partly disputed but most likely very real) ostraka graffiti at Iruña-Veleia (Basque-Roman city of Antiquity on which I have written extensively in the past) is freely available online. 760 officially recognized scripts on ceramics from Iruña-Veleia excavated by the archaeology firm Lurmen S.L. (approximately between years 2002-2008)have been analyzed. A number of these ceramics contains scripts which may be assimilated to Iberian/Tartessian writings. This number may be underestimated since more studies need to be done in already available and new found ceramics. This is the second time that Iberian writing is found by us in an unexpected location together with the Iberian-Guanche inscriptions of Lanzarote and Fuerteventura (Canary Islands). On the other hand, naviform scripting, usually associated to Iberian rock or stone engraving may have also been found in Veleia. Strict separation, other than in time and space stratification, between Iberian and (South) Tartessian culture and script is doubted. The aboriginal castro covered 19 Ha (=190,000 m², ~47,000 acres), being the largest of its kind known in all Ancient Cantabria. Many brooches (fibulae), characteristic of the indigenous horsemen’s clothing are concentrated near the main gate, suggesting that a key episode of the battle took place there. Around the castro, the Romans built their characteristic siege fortifications. Caligae sole nails, tent holding pins and weapons have been found all over the place, including a dagger with silver decorations and even a catapult fire projectile. After the capture the Romans built there their own fort. First a campaign one with earth walls and then another more consolidated one with stone walls. Milestones defining the pastures assigned to the Legio IV Macedonica from those of the nearby town of Iuliobriga further North have also been found. In an analysis of Etruscan mtDNA Ghirotto et al. (2013) evaluated haplotype diversity in 30 samples of ancient remains from Etruscan burials that date to between 700-200 BCE. However, the authors did not identify haplogroups for these ancient remains. Analysis of the mtDNA data by haplogroup could provide additional insight into relationships among the ancients samples and to modern populations in the region, so we attempted to identify haplogroups for the 30 ancient mtDNA haplotypes listed in Table S1 of Ghirotto et al. These include 14 samples tested by Ghirotto et al. (2013), and 16 samples tested by Vernesi et al. (2004). Ghirotto et al (2013) reported results in the mtDNA the control region at markers 16024-16384. Results were reported relative to the revised Cambridge Reference Sequence. These results should be sufficient to identify those haplogroups that have defining mutations in this region. We compared the ancient mtDNA haplotypes to Phylotree version 15. 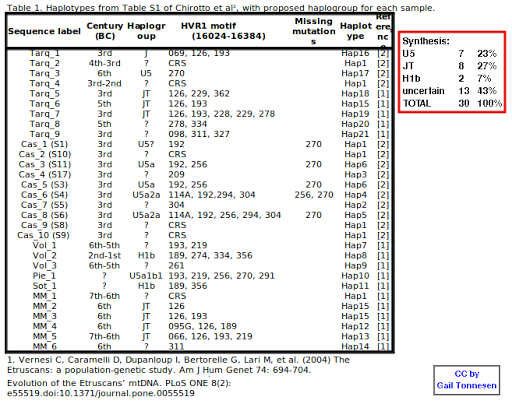 Seven of the haplotypes appear to be U5, however, the U5 defining mutation 16270 was identified in only two of these seven samples. Key defining mutations for U5 subclades that should be present were not identified in several of these samples. For example, samples Hap4 and Hap5 both appear to be U5a2a (based on the combination of 16114a and 16294). U5a2a should also have mutations at 16256, 16270 and 16526, but the test results did not report any of these 3 mutations in Hap4, and only found 16256 was reported in sample Hap5. Reversions at marker 16270 occur infrequently in U5, and it is possible that some of the ancient mtDNA samples could have a reversion at 16270, however, the probability is extremely low that that 5 of 7 samples would have this relatively rare reversion. Thus, based on these probable U5 samples, the reported results for the ancient mtDNA samples appear to have a high error rate of missed markers in their results. Eight of the samples appear to be JT, based on the mutation at 16126. Two of the samples might be H1b based on the mutation at 16356. We were unable to identify haplogroups for any of the remaining 13 samples. Six of the samples are CRS, but given an apparent high rate of missed identification of 16270 in most of the apparent U5 samples, it is not possible to predict haplogroup for the CRS samples. Figure 3, the median joining network, has the haplotypes connected in a way that is inconsistent with their probable relationship in the mtDNA phylogeographic tree. We recommend re-evaluating the median joining network using the probable phylogenetic relationships among the samples. We also recommend that the coding region be sequenced for these samples to better determine their haplogroups and subclades, especially for the 13 of the 30 samples whose haplogroup cannot be determined from the control region results. We also recommend sequencing control region more completely because important defining markers for several of the haplogroups tentatively identified here are found in the region from to nucleotide markers 16385 to 16569. 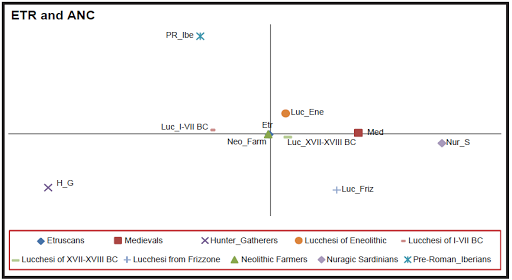 Based on the 17 samples for which we were able to predict haplogroups, JT and U5 are the most common haplogroups in the ancient Etruscans samples. These do not appear to be related individuals because there is considerable diversity in haplotypes among the JT and U5 samples. However, these results are uncertain because of the possibility that the some markers were not reliably detected in the ancient mtDNA samples. Additional testing of the coding region and re-testing of the control region are necessary to fully evaluate the ancient Etruscan samples in the context of ancient and modern populations. Vernesi C, Caramelli D, Dupanloup I, Bertorelle G, Lari M, et al. (2004) The Etruscans: a population-genetic study. Am J Hum Genet 74: 694-704. See also: Were the Etruscans after all Native Italians? Were the Etruscans after all native Italians? A new study casts doubt on the Anatolian origin theory of Etruscan origins. As you may know, two main theories have been proposed for the origins of the ancient Italian civilization that taught Romans nearly everything, especially in the field of architecture: on one side that they were Bronze Age arrivals from Anatolia, maybe related to ancient Trojans, which had some support on art aesthetics, the historical presence of a close relative of Etruscan language in the island of Lemnos, some classical theories and, more recently, an ancient mtDNA study (Vernesi 2004), which found the mtDNA of ancient Etruscan aristocrats to be closest (by FST) to Turks than to any other studied population, excepted (by slight margin) modern Tuscans. The main alternative theory proposes that Etruscans were a local development, what would be also consistent with an Anatolian genetic affinity because the Italian peninsula, including Tuscany, shows repeated waves of cultural influences from the Western Balcans first (Neolithic) and from the Aegean later on (Chalcolithic especially). The debate seems however far away from reaching any strong conclusion, notably now that a new study revising Vernesi’s data finds a different and rather puzzling set of affinities for ancient Etruscans. 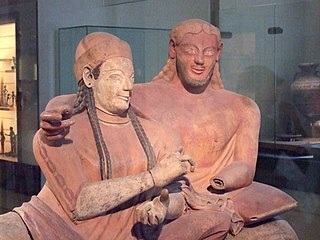 The Etruscan culture is documented in Etruria, Central Italy, from the 8th to the 1st century BC. For more than 2,000 years there has been disagreement on the Etruscans’ biological origins, whether local or in Anatolia. Genetic affinities with both Tuscan and Anatolian populations have been reported, but so far all attempts have failed to fit the Etruscans’ and modern populations in the same genealogy. We extracted and typed the hypervariable region of mitochondrial DNA of 14 individuals buried in two Etruscan necropoleis, analyzing them along with other Etruscan and Medieval samples, and 4,910 contemporary individuals from the Mediterranean basin. Comparing ancient (30 Etruscans, 27 Medieval individuals) and modern DNA sequences (370 Tuscans), with the results of millions of computer simulations, we show that the Etruscans can be considered ancestral, with a high degree of confidence, to the current inhabitants of Casentino and Volterra, but not to the general contemporary population of the former Etruscan homeland. By further considering two Anatolian samples (35 and 123 individuals) we could estimate that the genetic links between Tuscany and Anatolia date back to at least 5,000 years ago, strongly suggesting that the Etruscan culture developed locally, and not as an immediate consequence of immigration from the Eastern Mediterranean shores. 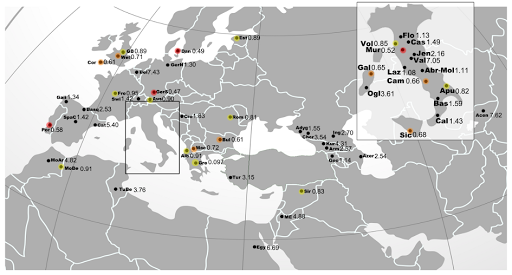 The study finds that ancient Etruscan mtDNA is closest among modern populations (by FST) to Southern Germans and, following closely, a varied array of other Europeans (totally the opposite to Vernesi’s findings), and rather not too close to Turks or other Eastern Mediterranean populations. A model of genealogical continuity across 2,500 years thus proved to best fit the observed data for Volterra, and especially Casentino, but not for another community dwelling in an area also rich with Etruscan archaeological remains (Murlo), nor (as expected) for the bulk of the current Tuscan population, here represented by a forensic sample of the inhabitants of Florence. Therefore, the present analysis indicates that the Etruscan genetic heritage is still present, but only in some isolates, whereas current Tuscans are not generally descended from Etruscan ancestors along the female lines. Because Medieval Tuscans appear directly descended from Etruscan ancestors, one can reasonably speculate that the genetic build-up of the Murlo and Florence populations was modified by immigration in the last five centuries. An intriguing issue not considered apparently by the authors is the appearance of greatest genetic similitude with some populations of Central Europe. I would consider preliminarily that a possible line of interpretation of this data might be that the Etruscan elites might have arrived with the Urnfields expansion peoples (Indoeuropeans most probably) but were culturally and linguistically assimilated by the native substrate (proto-Etruscans did participate of the fashion of corpse incineration and burial of the charred remains in urns, which even led some to propose that they were Indoeuropeans in fact). However this clashes with the fact that they also appear extremely close to Central European Neolithic peoples, which are not at all similar to modern nor Urnfields period Central Europeans. So I have to admit that a local Neolithic origin may be the most reasonable hypothesis with this data and that the irregular Central European affinities may have other explanation (such as local preservation of a mtDNA pool closer to Neolithic one than usual).